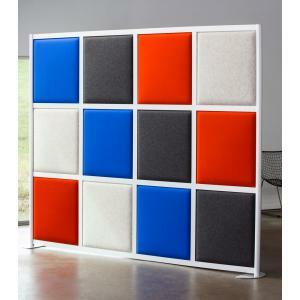 Flex is a vibrant and adjustable space divider that can be configured with various sizes and colors. Move and divide your space as you need! 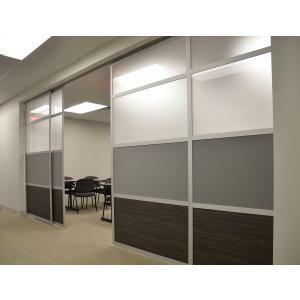 The LOFTwall Flex modern space divider is a unique way to divide your home or office space. It is lightweight yet durable for commercial or home. The panels are made of a thick composite textile with sound absorbing qualities. It uses a flexible foam core encased in a special fabric blend. The end posts are made of anodized matt silver aluminum. It is an award winning design that gives you much flexibility to shape your collaborative space! The sturdy aluminum frame comes in a modern natural anodized finish. You may add on panel pieces to make it any size you need. The wall and frame come with easy assembly instructions. LOFTwall has a commitment to reducing waste, using green materials, and manufacturing dividers in the USA as efficiently as possible.